Christmas Rice is a remarkable dish, but what makes a dish special? Is it some special ingredient that complements all others and pushes flavour to the edge? Or is it some special technique? To me, it’s simply the human element that makes the difference. Nothing special, just the “you” ingredient in a recipe.That’s the hidden part in any recipe that comes to play every time you step into the kitchen ready to cook. And it’s no different for chefs worldwide. Given the same ingredients, different chefs will come up with mouthwatering dishes all based on their experience, training, background, personal tastes, geographical location, creativity and most importantly, personal outlook on life. Yeah, I know that last one supposedly has nothing closely related to cooking, but I believe it counts not only in cooking but in everything we do. If you’re a positive thinker, nothing that comes in your way will phase you. You’ll be ready for anything; if a situation presents itself you will be able to think on your feet and overcome your obstacles. By now you may be wondering what does all of this have to do with Christmas Rice. I’ll tell you. When faced with new dishes, to me it’s a welcomed challenge, experiment and, most of all, a fun adventure. 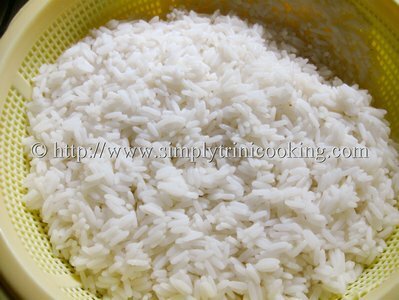 I try to envision what the dish should represent from a personal point of view and, to me, my Christmas Rice should reflect our culture around Christmas time: festive, colourful, and flavourful. This is the human element coming to play. 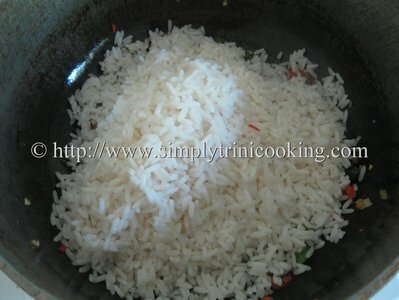 Someone else may have a different idea on how they feel their Christmas Rice recipe should be and that’s OK as well. 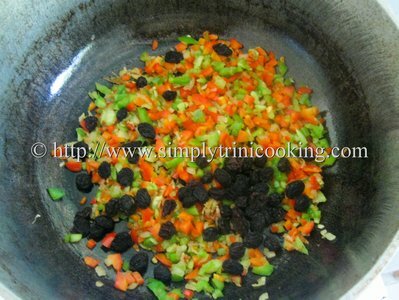 So how do I bring about festive, colour and flavour to reflect our Trini culture all in one dish? 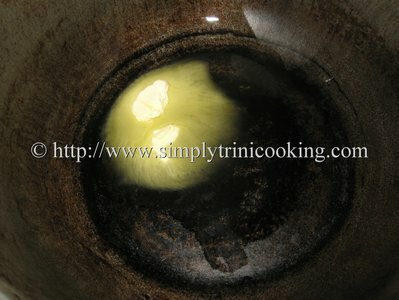 Be innovative with the ingredients you have around you …So let’s see what I did……For that festive feel, I used raisins; for that trini flavour, I used a combination of pimento peppers, thyme and ginger…. And for colour, red and green sweet peppers did the trick. 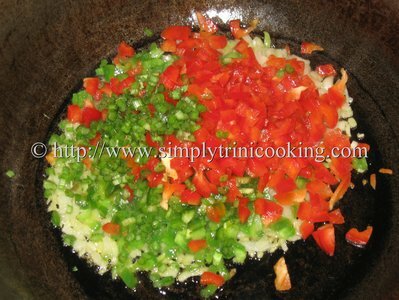 These ingredients seemed to balance the flavours very well……I wanted to use Chadon Beni but it would have overpowered all the other subtle flavours in this dish. Melt butter over a medium flame. 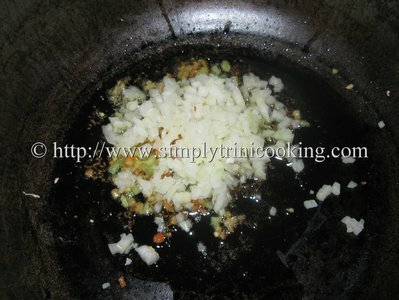 Saute the ginger, garlic, and onion for one minute. Add celery, thyme and sweet peppers. 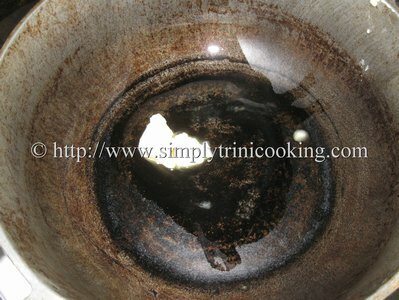 Let cook for one minute. Note: Try not to overcook the sweet pepper because they would lose some of their vibrant colour. Add raisins and mix well. 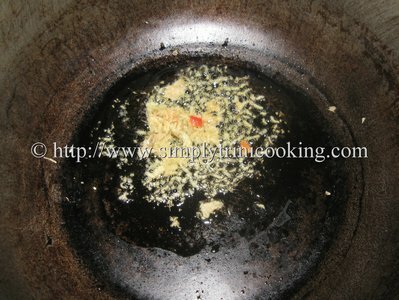 allow to saute for about 30 seconds. Add rice. 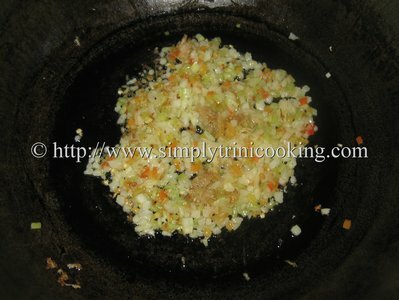 Mix well and adjust salt to taste. (If you like you can add a bit of black pepper now). 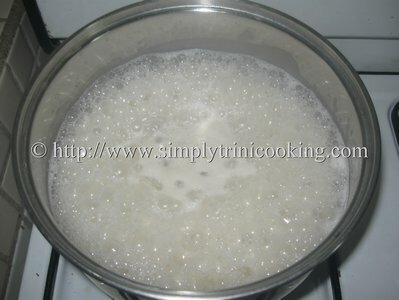 So you see how because of the human element I was able to take an idea and create a Christmas Rice recipe from a trini point of view. Now, I would like to know about your opinion on this recipe. You can leave your comments below. Of course more recipes to come. 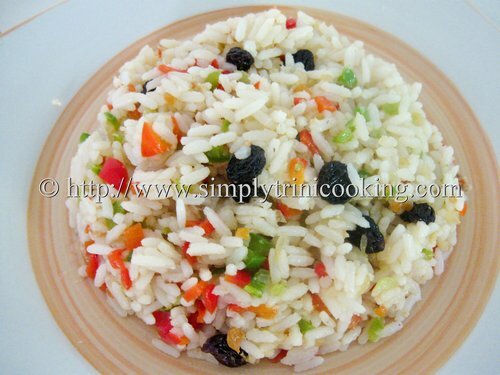 What’s your take on Christmas Rice? 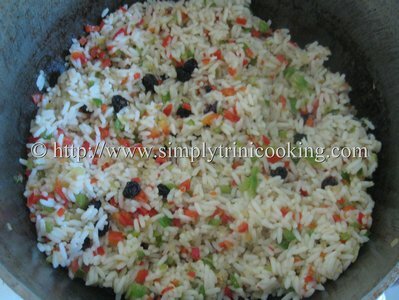 Thanks I just love the Christmas rice, will try it out for Christmas day. I didn’t have a red sweet pepper so I grated a carrot in it’s place; turned out great, not sure if it would still be called Christmas Rice though. Hi Disappointed, I am disappointed that you are disappointed. I am also disappointed to know that you are not a regular reader or else you would know that you can skip this reading (its a blog mind you) and go directly to the recipe with no write up and you would get all the information you are looking for (including nutrition information, serving size and cooking time, etc) when you click “Print this recipe”. This is at the bottom of all updated recipes. 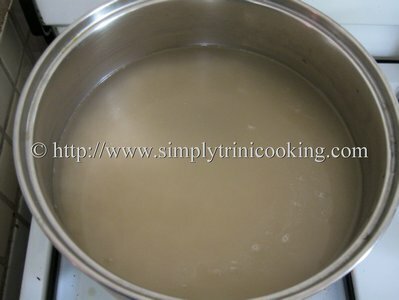 And by the way, you should know how much water is needed to boil rice. Thank you for your comment.